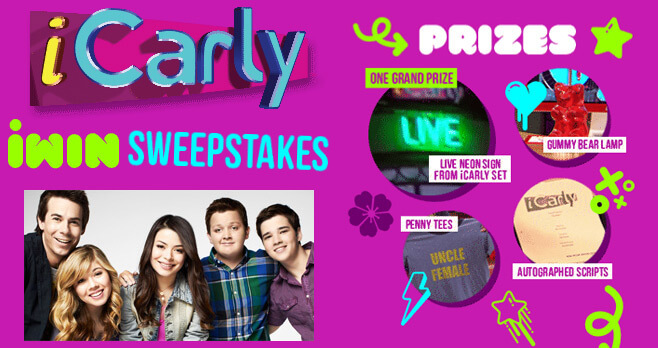 To celebrate 10 years of iCarly, Nick and TeenNick invite you to enter the iCarly iWin Sweepstakes 2017. All this week, look for the daily secret code word during the 10th Anniversary Every iCarly Episode Marathon and enter online at www.teennick.com/icarlysweeps for your chance to win autographed scripts, Penny tees, Gummy Bear lamps or even a Live Neon Sign from the “iCarly” set. Every code is a new chance to win. To enter the iCarly Sweepstakes, you must have the permission of your parent or legal guardian prior to entering if you are under the age of majority in your state of residence and be: a legal resident of one of the 48 contiguous United States or the District of Columbia, and be between the ages of 6 and 24 years old at the time of entry. The Sweepstakes shall consist of 5 separate and independent daily sweepstakes each with its own separate pool of entrants and prizing and a final Grand Prize sweepstakes, as defined below. In order to enter, find TeenNick on your local television guide and tune-in to the “10th Anniversary Every iCarly Episode Marathon”. As you watch the Marathon each day, keep your eyes open for the reveal of that day’s secret code word. Once you have seen the Daily Code, visit www.teennick.com/icarlysweeps and input the Daily Code in the field provided. If you correctly input the Daily Code, you will gain access to enter that day’s Daily Sweepstakes. Follow the instructions to complete and submit the online Daily Sweepstakes entry form. Limit one entry per Daily Sweepstakes Period per person/household/email address. Sponsor will conduct a random drawing on each of the Daily Drawing Dates set forth in the chart above in order to select one potential winner for each corresponding Daily Sweepstakes. After the determination of the potential winner of Daily Sweepstakes #5, Sponsor shall conduct a random drawing (approximately around September 9, 2017) in order to select one potential winner for the Grand Prize Sweepstakes. Daily Prize #1: One (1) script from “iCarly” signed by the cast and one (1) Penny T-Shirt. Daily Prize #2: One (1) script from “iCarly” signed by the cast. Daily Prize #3: One (1) Gummy Bear Lamp and one (1) Penny T-Shirt. Daily Prize #4: One (1) script from “iCarly” signed by the cast. Daily Prize #5: One (1) Gummy Bear Lamp. One (1) grand prize is available to be awarded in the Grand Prize Sweepstakes and shall consist of one Live Neon Sign from the “iCarly” set. The ARV of the Grand Prize is $200.00. To receive the name of any Winner, send a self-addressed, stamped envelope to: “iCarly iWin Sweepstakes” c/o, Nickelodeon, 1515 Broadway, Space #37-59D, New York, NY 10036 for receipt by November 9, 2017. I really love your show a lot???????????????? iCarly can Lil Pump smash already? I love the show!! I relate to Sam So much!! I hope I can be on your show???????????????? What is the code for September,7? Are you Spencer from the icarly show? I need the code and I love iCarly so much and I was watching the 10years iCarly.